Major pad modification work is continuing to take place at Pad 39B, ahead of hosting the Space Launch System (SLS) for its debut launch in 2017. With the former Shuttle structures removed from the pad’s surface, efforts are now focusing on installing an new flame trench, replacing bricks and concrete that still bears the scorch marks from the Apollo era. 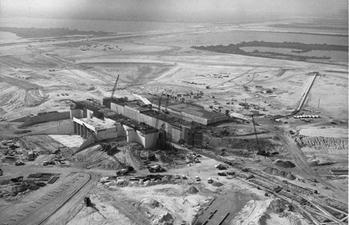 As the United States pushed forward with its plans to land a man on the moon by the end of the 1960s, the Kennedy Space Center’s construction included the what would become two iconic launch pads. The first sign of the pads taking shape near the coastline saw earth movers build the pyramid base, prior to tons of concrete, bricks and support structures created the flame trench. Once constructed, the trench proved its worth, ably deflecting the power and the plumes of the Saturn V’s five F1 engines during their ignition and launch. Modified for the Space Shuttle Program (SSP), the flame trench – 490 feet long, 58 feet wide and 42 feet deep and built with concrete and refractory brick – bisected the pad at ground level. The flame deflector system included an inverted, V-shaped steel structure covered with a high-temperature concrete material five inches thick that extended across the center of the flame trench. One side of the “V” received and deflected the flames from the main engines; the opposite side deflected the flames from the Solid Rocket Boosters (SRBs). There were two movable deflectors at the top of the trench to provide additional protection to hardware from the SRB plumes. The trench performed well during its role with Shuttle, all the way through to STS-124, when Pad 39A’s trench wall suffered its most dramatic failure. The event occurred as Discovery’s Solid Rocket Boosters (SRBs) ignited, with the exhaust hitting what is now known to have been a weakened flame trench wall. A large section of the Apollo-era bricks – numbering over 3,500 – were sent flying out of the trench in several directions, some of which were sent out as far as the Pad’s perimeter fencing. 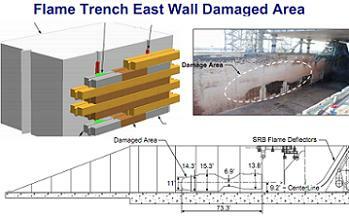 The failure of the large section of trench wall was due to the Anchor Plate system becoming severely corroded and weakened over time. No debris hit Discovery during her early phase of ascent, although imagery from the FLIR Ranger III XR+ MWIR – the expanded name for an infrared camera used to observe launches – showed debris, first observed around T+1.1s, shooting up and away from the pad, some of which rose higher than the height of the water tower. Some of the debris was likely to have been the water baggies that are used on the SRB holes on the Mobile Launch Platform (MLP), with most of the bricks kept below the platform’s Zero Level structure. However, some bricks were found on top of the MLP. The area saw the remaining bricks in the weakened area removed, prior to repairs that included the spraying of Fondu Fyre – a Refractory Concrete – on to the surface of the flame trench. The trench performed without major incident during its remaining Shuttle launches. While Pad 39A is currently mothballed, Pad 39B has undergone some dramatic changes since being repurposed for its role with SLS. 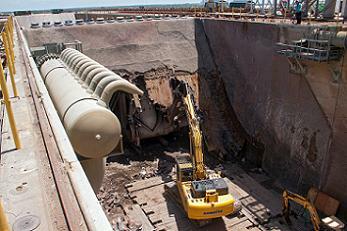 Controlled demolition of Pad B’s Shuttle structures began in September, 2010 – with deconstruction work commencing on the Rotating Service Structure (RSS), ahead of the removal – block by block – of the Fixed Service Structure (FSS), rendering Pad B a clean pad for the first time in over 30 years. Under the guidance of the Ground Systems Development and Operations (GSDO) Program office, along with Center Operations at KSC, 39B now has a steel and concrete structure that houses two elevators and the associated machinery. While repair work was conducted on concrete slopes and surfaces around the pad, the iconic flame trench is now the focus of attention, as engineers work to remove the legacy flame deflector that sits below and between the left and right pad surface crawlerway track panels, along with Apollo-era bricks from both walls of the flame trench. The replacement, known as the “universal flame deflector” is tasked with accommodating SLS and other commercial launch vehicles, although only SLS is a confirmed future tenant of the pad at this time. Following simulations using NASA Ames’ supercomputer, a deflector design – that could withstand the high heat from plume exhaust, that did not result in plume blow-back, and whose surface pressure was within design margin limits – was selected. Further design work on the new flame deflector and flame trench designs should be finalized by early 2014, allowing for construction the following year. 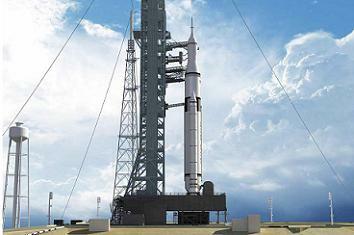 Just over two years later, the first SLS will christen the new flame trench, when the Heavy Lift Launch Vehicle (HLV) makes its debut launch on what is currently Exploration Mission -1 (EM-1) – although breaking news on L2 notes this opening flight is in the process of being replaced with different – more ambitious – mission.